Jourdanton’s Allie Wheeler flips the ball to first base in Game 2 against Blanco. 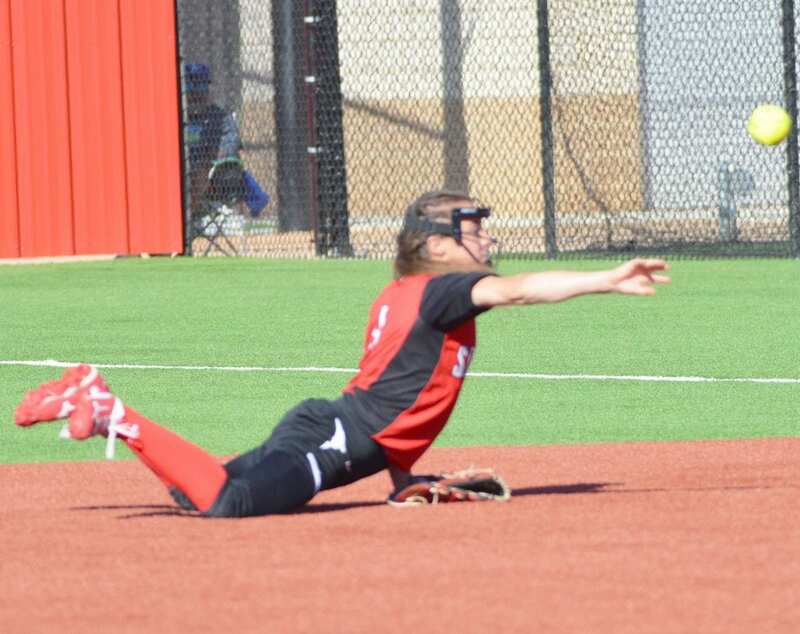 The Jourdanton softball team continued its postseason run last week with a series sweep of Blanco in the Region IV-3A quarterfinals. The Squaws advanced with a come-from-behind 4-2 win in Game 2 on Friday night at the Jourdanton ISD Sports Complex. Jourdanton fell behind 2-0 before rallying for the victory. The Squaws cut the deficit in half in the fourth inning before taking the lead for good in the fifth. Jourdanton scored twice in the frame and added on an insurance run in the sixth. Cladi Muñoz, who went 2 for 3 at the plate, had two RBIs and a pair of triples. Allie Wheeler was 1 for 2 with an RBI, and Kristina Ramirez went 1 for 3 with an RBI. Laney Harlan had one run, going 1 for 3 at the plate. Bailey Longoria picked up her second win of the series with an eight-strikeout performance. She allowed one earned run on seven hits. Jourdanton had four errors in the game. Longoria allowed no earned runs in a 7-2 win at Blanco in Game 1 on Thursday. She gave up four hits and struck out three. In Game 1, Ramirez had two RBIs on a 2 for 4 night. Rachel Schnelle and Lexi Wheeler each scored two runs, the latter going 2 for 3. Allie Touchstone also had two hits in the series opener. Jourdanton extended its winning streak to 14 games. The Squaws last loss came more than two months ago on March 13. With the sweep, Jourdanton will face Bishop in a best-of-three Region IV-3A semifinal series this weekend. The Lady Badgers, the third place team out of District 31-3A, defeated San Diego in the regional quarterfinals. Game 1 will be at 7 p.m. Friday at Texas A&M-Kingsville. Game 2 is scheduled for 5 p.m. Saturday at the JISD Sports Complex, and a third game will be played 30 minutes after Game 2 if necessary.